With online poker officially legal in the United States on a Federal level thanks to the revision a 1961 Federal Law, it is now up to the States to decide whether they want to allow a State run poker site or not, and so far three states have; Delaware, Nevada, New Jersey, and Pennsylvania. There has been opposition to Federal regulation and some parties even want to re-reverse the Federal Wire Act decision stated above. Most States are gun ho about setting up a State run poker site because it will generate a plethora of taxes which are currently going to poker sites whom are set up overseas in countries like Costa Rica, Antigua, and Panama. These poker sites are perfectly legal to play at, but the United States is trying to restrict these companies from taking American based players for pure greed and protectionist reasons. Aside from it being completely against our Foreign Trade the USA continues forward. There are so many laws in so many different countries it is literally impossible for any one person to keep track. In a nut shell let me break down how the United States works so that you can choose a poker site that properly fits your residence. Currently there are “State run poker sites” and “Non-American run poker sites”. Nevada – The first state in the USA to legalize intrastate poker over the internet and on April 30, 2013, Ultimate Poker made history by being the first regulated and legal online poker room. In September 2013, WSOP.com became the second regulated poker website in Nevada. South Point, powered by Real Gaming, was the third online poker site which went live in February of 2014. Delaware – The second state in America to legalize intrastate online poker which starting operating live in November of 2013. In Delaware, licenses were issued to the three racinos; Delaware Park, Dover Downs and Harrington Raceway. New Jersey – The third state in the United States to regulate and pass poker online. Their soft launched happened on November 21, 2013, with the public launch coming to fruition five days later. In the initial launch, New Jersey awarded seven different licenses over fifteen gambling sites; five being poker sites. These poker rooms accept the entire world but many have decided to block a few US states. At the moment there is only 1 online poker room called BetOnline.ag, which is based in Panama, that accepts all 50 US States. There are two other main brands, the Revolution Network and the Merge Network. Lastly there is Bovada. Despite having a global presence these poker sites still struggle to bring in enough poker players because the way the United States tries to decline online gambling deposits. As I said before, the United States doesn’t want the money leaving the United States so in order to keep the money here they issued something called the Unlawful Internet Gambling Enforcement Act, (UIGEA) for short. This didn’t make it illegal for Americans to play online poker, it just put a massive restriction on banking for Global poker sites. The current success rate for a global poker site from signup to deposit is only 15% because of these credit card and banking problems. Ok, so now we understand there are two varieties of internet poker websites out there. Where do you even start? Well first off, if you live in a state where poker is not very popular, or your population is relatively low we recommend a Global Site such as the two below. 1. BetOnline.ag – I recommend this to most people because it’s pretty easy to deposit and withdraw here, they are safe and are the only guys out there that take all 50 States. 2. Bovada.lv – This is owned by Bodog. They set up this poker site to accept only Americans so while it’s not a Global poker site per say, it’s the only strictly American poker site. They now block players from Delaware, Maryland, New Jersey, Nevada, New York, and Washington. If you live in Washington, Maryland, Kentucky, New York, Utah, Louisiana or Missouri you will be pushed towards playing at Global rooms since these States are against all forms of online gambling; at least for now but that will likely change as it has already started to. 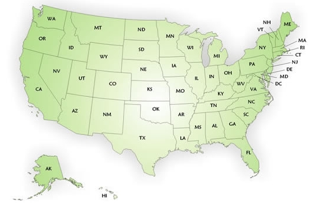 On the other hand, if you live in a well populated State we recommend you selecting a poker site that is State run. While I don’t really like recommending a State run poker site because I don’t believe they will have enough games going, it might be the only option if you are having problems depositing at the websites mentioned above. Let me give you an example of this fallacy by looking at other countries that have taken the same approach. With a population of 65 million, their largest poker site is called Winamax. They only accept those that live within the borders of France. Unlike the United States, all 22 regions of France can play at one poker site licensed by France. According to PokerScout which tracks poker site traffic, Winamax is the largest site in France and only has 1,500 people that log in and play poker. This may seem like a lot if you compare it to the couple hundred that you might find at a brick and mortar poker room but this number is very low. Ok, so the largest site in France has 1,500 players at any given time but has a population of 65 million. The largest US State has a population of 38.3 million (California), half the size of France, and the largest poker site that accepts all of the USA only has site traffic of 1,600 players at the tables per day. The US population is 317 million so if all variables held equal, then California would only have approximately 1,600/10 or 160 players at any given time you logged in to the biggest poker site at the largest US state. The numbers just don’t make things feasible, and were not even taking into the fact that multiple sites will be competing for these players. I’m strongly convinced that when State run poker sites fail, the Federal government will establish interstate poker rooms. While I strongly believe this to be true, it will not be until 8 more years at least. The government has already said it wants to leave it up to the States, but a strong gut feeling tells me that they will sever ties with certain strategic partners located overseas and we will see not just a Federally run poker site, but Federally run poker software. Currently, the plans are for poker sites to partner up with United Kingdom based poker sites. Time will tell but for now your options are as mentioned in this article for playing poker in the US. This article will be updated periodically as laws in the US change. Myself included, never thought that sportsbooks would ever be available online on mass scale in the United States. After a recent interview with I. Nelson Rose who has been pretty much spot on throughout the years, his belief is we will see the same thing happen with sport betting as with poker. The laws are already in place to allow it, it’s only a matter of time he says. Sportsbooks have been under the same attack as poker sites with their .com domains being seized as was seen when Bookmaker closed to open bookmaker.eu and when Doylesroom closed to open a .ag site, only to eventually close down altogether. Will we see all forms of online betting in the United States, my gut says yes from all the research and arrows pointing. To see your state laws please navigate above. These gambling articles are updated periodically.